When Nicholas Gilbert purchased the property at No. 121 Chambers Street in 1835, the area was still a respectable, residential one. At the same time, he bought the three lots directly behind, at Nos. 103 through 107 Reade Street. Gilbert and his family moved into the Chambers Street house; but would not stay appreciably long. By Gilbert’s death in 1851 his former home was being run as a boarding house, and the three Reade Street houses were rented to blue collar workers and servants. By 1860 the area was seeing the rise of handsome commercial buildings and lofts. That year Gilbert’s two sons divided up the property and set about to replace the old houses with modern money-making business buildings. Frederick Gilbert, who was a ship chandler by trade, took the family home and the house directly behind it at No. 103 Reade. James took Nos. 105 and 107 Reade Street. They hired an architect whose name has been lost, to design two matching stone buildings—Frederick’s running through the Chambers Street-Reade Street lot; and James’ lining up next door. Frederick Gilbert’s No. 121 Chambers Street was completed in 1860, several months before the Reade Street structures. Like his brother’s double-wide building, it was an Italianate beauty. Sandstone cornices defined the second and third stories and the openings sat within carved frames, all but the topmost story ornamented with heavy scrolled keystones. The middle bay of the second floor was highlighted by a temple-like projection of engaged Corinthian columns and a classical pediment. A trio of graceful arches separated by engaged Corinthian columns and pilasters created the cast iron storefront. The Reade Street façade was slightly subdued, treated as the one-third of the design that included James Gilbert’s building. No. 121 Chambers ran through the block to No. 103 Reade (left). The James Gilbert building, abutting, was designed to visually include No. 103, the center section being a near-match to the Chambers Street facade. Irving J. Cook vigorously proclaimed his innocence and reminded the justice that Nathaniel G. Holton, a clerk of Storrs Brothers, had first ascertained “his standing as a businessman.” He explained to the court that in the period since the sale “he had been unfortunate” and was compelled to declare bankruptcy. By 1875 George Place & Co. was in the building, a manufacturer and seller of drilling machines, lathes, planers, and other equipment. The firm drew the wrath of The Sun in 1883 when the newspaper sought to uncover bureaucratic waste. An investigative journalist was sent to the Norfolk Navy Yards and on July 6 the newspaper reported on his findings in a front page article. “Hundreds of thousands of dollars have been invested in machines that are never used, and never will be.” The article mentioned specifically “one eight-foot radial drill, for which the Government paid $4,430; one ten-foot radial drill, $5,680; one set of flange clamps, $825; and one iron flange bending machine, $2,175; the total cost was $13,110.” The equivalent amount in 2015 dollars would be about $320,000. At about the same time the cigar manufacturer Howard Ives was doing business in No. 121 Chambers Street. On Friday, August 21, 1885 his bookkeeper, Duncan S. Wylie, stopped by his broker on Wall Street and purchased 1,500 shares of Boston, Hartford and Erie Railroad Company stock. As he left the office, he slipped the envelope with the stock certificate into the pocket of his cut-away coat. Or so he thought. The envelope fell out of his coat somewhere between Wall Street and the Chambers Street office. Panicked, Wylie placed an advertisement in The New York Times the following day on the slim chance that the finder would be honest. His hopes were answered. A messenger boy, William Dunn, had found the envelope and turned returned it to Ives. “Mr. Wylie rewarded Dunn,” reported the newspaper. George Place was still in the building in 1888. By now other machinery and hardware concerns were moving in. Bayles Brothers, commission dealers in hardware, operated its offices here; and C. J. Stebbins, listed as “nail merchant” was in the Reade Street side of the building by 1892. In the first weeks of 1893 the signs of a serious impending financial depression were looming. John W. Lauterbach, a 54-year old German immigrant, had been doing a highly-successful import business of baskets and willowware for 30 years. His business took up the entire top three floors from Chambers Street through to Reade Street. But in the past few years he had told his wife often that his business was decreasing. It changed his personality, which grew “morose and melancholy.” It all came to a head on the morning of February 4, 1893. Upon arriving at his office he asked the bookkeeper, Water Daberautz, for the balance sheet for 1891 and 1892. It reflected a loss of $5,026. He sat in his third floor office for a while, and then suddenly stood up, remarking to Daberautz “I’ll make a change in this soon.” He went to the top floor where his private office was located. The newspaper related “He struck the sidewalk all in a heap, rolled over, and lay quiet. Death was undoubtedly instantaneous.” Lauterbach left his wife an estate of approximately $25,000 (a little more than $675,000 in 2015). By March 1 that year Stebbins had two branch bicycle shops—one in the Bronx and another in Brooklyn. He also distributed the weekly newsletter War Paint, published for cycling enthusiasts by the Syracuse Cycle Company. The street level space that had housed the Storrs Brothers fancy goods emporium had been converted to a saloon in the last decade of the 19th century. In June of 1901 it was leased to the Otto Huber Brewery. “Tied” saloons were a popular experiment at the turn of the last century. By running the taverns themselves, breweries were able to narket only their own brands. The saloon at No. 121 Chambers Street was here at least through 1903. After suffering abuse and neglect through most of the 20th century, the buildings of the Tribeca area drew attention as the neighborhood was reborn. Trendy shops and cafes sprouted in former factory spaces and vast warehouse and commercial lofts were renovated as residences. The Reade Street buildings retain their charming cast iron storefronts. In 1992 the top three floors of No. 121 Chambers Street were converted to apartments. The storefront of the Chambers Street side has been brutally altered; however the ground floor of the Reade Street buildings is relatively, and surprisingly, intact. 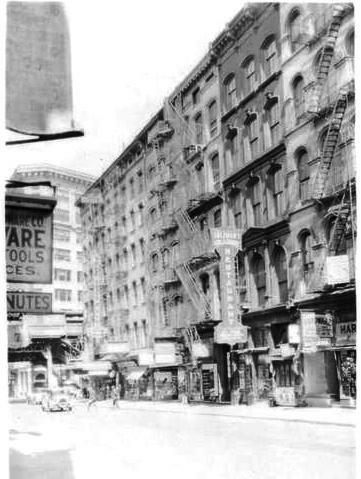 The handsome grouping is a vivid reminder of the days when Chambers and Reade Streets were changing from residential to business interests. thank you for the detailed history. apparently, the building has been sold. Great article! Joseph W. Storrs is an important figure in firearms history; he was among the first big commercial "sales agents" for firearms, and was one of the reasons that Smith & Wesson became as successful as they were. Sales agents handled the wholesaling and distribution of products (back when you couldn't throw something in a box and mail it across the country), and his experience in the railroads was undoubtedly instrumental in helping him send product far and wide. He was also something of an advertising pioneer; his obituary claimed that he was the first to use actual product engravings in advertising. This claim seems a bit far fetched, but one cannot doubt that his efforts were instrumental in helping Smith & Wesson become a Civil War enterprise. I believe that Storrs did most of his business at 252 Broadway, but the 121 Chambers address does pop up in some of the period advertising, including what I think was his best add—in the April 2, 1859 issue of Frank Leslie's Illustrated Newspaper, in which he featured a testament from Cassius Clay.